But his two-acre rice crop was utterly ruined. His 350,000 rupee-debts ($5,500) from farm loans were unpaid. His cash reserves were gone. 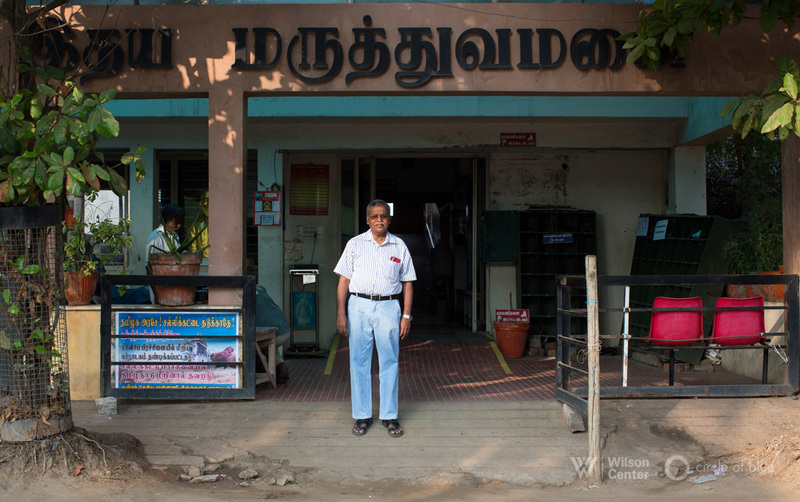 Early on January 7, as he regularly did, Vijayakumar left his cinderblock home with its thatched palm roof on foot. He walked haltingly past paddies of yellowed rice plants, including his own, then a little further, to the coconut tree near the forest edge. There, he hanged himself. 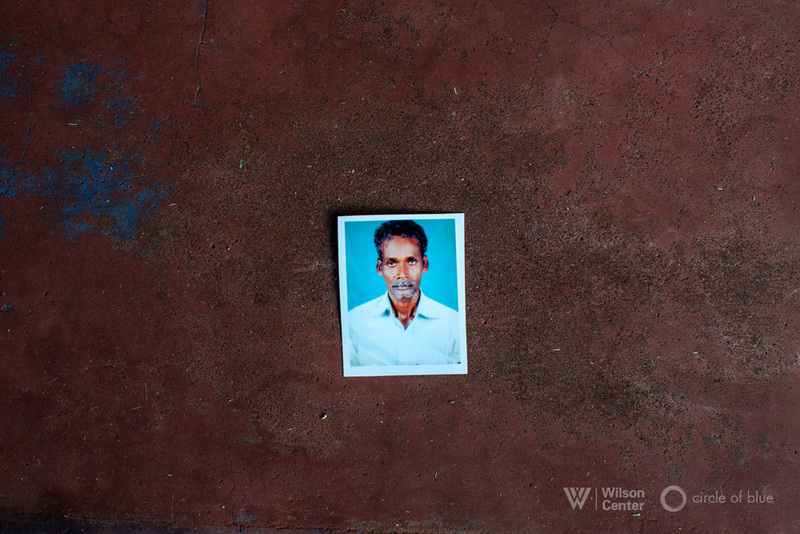 Ten days later, when Circle of Blue visited, Vijayakumar’s family and friends still gathered day and night on the high bank of a dry streambed to mourn his death. Cooking fires smoldered in the hard-packed yards of one-room homes. A warm breeze, scented with chutney spices and vegetables, stirred the palm branches that shade the village’s single straight path. Farmer suicides are by no means an unusual phenomenon in rural India. To acquire seeds, fertilizer, and equipment to plant a crop, farmers rely on private lenders that charge usurious rates. In one type of loan, called “thandal,” farmers are charged cumulative interest on the borrowed principal. Payments to the lender have to be made daily. If harvests fail, debts mount. By committing suicide, farmers believe they can distance their wives and children from responsibility for payments. One study published last year, and based on data from the National Crime Records Bureau, found that 300,000 Indian farmers killed themselves from 1995 to 2015. But here in the Cauvery River Delta, the largest grain-growing region in Tamil Nadu and one of India’s most productive food bowls, farmer suicides are rare. Or were. Never before has the delta experienced two failed monsoons in the same year, said farmers. 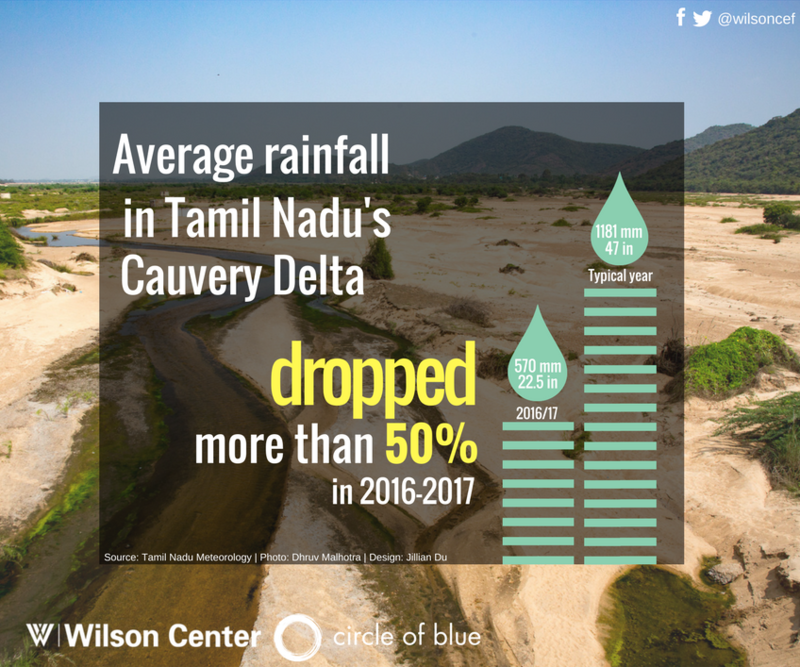 The Cauvery River, the principal source of fresh surface water for irrigation, is so depleted that farmers find it difficult to find puddles deep enough to water and bathe their cattle. Without water, harvests of grain, sugar cane, and other crops are half what they typically are in wetter years. Delta farmers who rely solely on river and rainwater for their crops are desperate. Cauvery River district officials counted 17 farmers who killed themselves from December to mid-January. Nearly 150 other farmers and several wives have died from heart attacks across Tamil Nadu, 120 of them in the Cauvery Delta, said Dr. R. Bharathiselvan, a 59-year-old cardiologist who practices in Mannargudi, a farming city of nearly 70,000 residents. In Karnataka, the state upstream from the delta, officials have counted 200 more farm suicides and heart attack fatalities. In one wrenching incident in mid-January, a 65-year-old Tamil farmer died in his field from a heart attack. Other farmers, after discovering him, carried his body back to their village. His 58-year-old wife glimpsed her lifeless husband and collapsed dead in a heap at his side. Indeed, the thickening chain of death and sorrow in the Cauvery River Delta, formed from the powerful links of water, agricultural, and industrial policy, is bludgeoning this Bay of Bengal state of 78 million residents. The human toll here, counted in the escalating numbers of shattered hearts, is a disturbing measure of how extravagant, water-consuming development practices no longer fit environmental conditions. The contest between dwindling freshwater reserves and steadily rising demand has been tightening for years in the Cauvery River Basin, which spans 81,155 square kilometers (31,334 square miles), in central Tamil Nadu. Of the state’s 16,682 villages, 13,305 were drought-affected in January, according to state government figures. The state’s 15 major irrigation reservoirs were filled to just 13 percent of capacity. 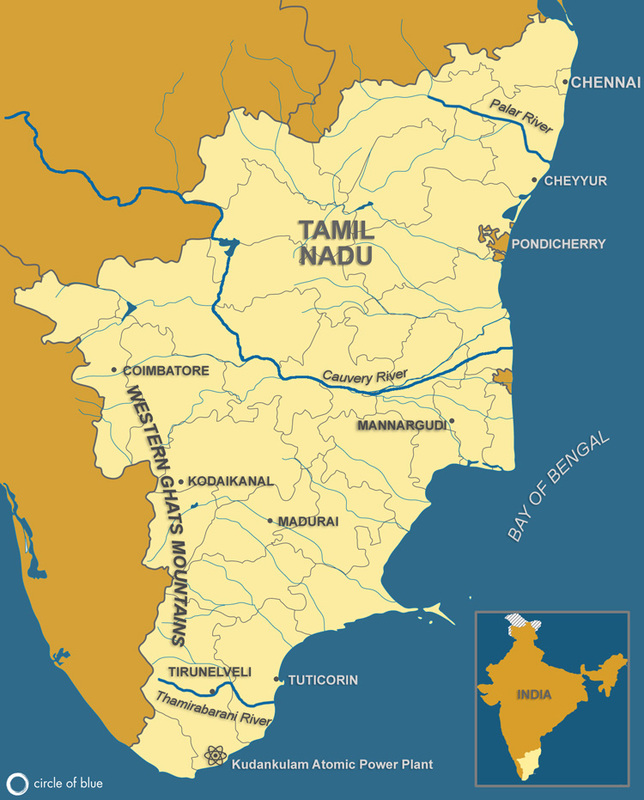 In the Cauvery Basin, which encompasses parts of three states and a small union territory, water from the main stem of the river and its tributaries no longer reaches the sea. In the last six months, the mismatch between supply and demand, driven by drought, has escalated to open conflict. Angry protests over erratic water supplies have erupted in villages and many of the region’s biggest cities. There are 100 dams and reservoirs in the basin, including the 2,000-year-old Grand Anicut. In almost every reservoir, water levels have dwindled to 30 percent or less of total capacity. The persistent dry weather is cruel in its scope and duration. The suicides and heart failures around Venganthankusi are a local consequence of the much larger trends in meteorology, policy, and practices that affect the entire Cauvery Basin. Riots occurred in two states late last year after the Indian Supreme Court ordered releases of stored water to downstream Tamil Nadu from upstream Karnataka. Karnataka officials balked at the order, arguing that there were insufficient supplies to satisfy users in both states. Karnataka’s reluctance to part with stored water is a powerful illustration of the basin’s condition. During dry periods there is no longer enough water available from the Cauvery River and its tributaries to meet demand. The river, in hydrological terms, is over-allocated. Though Karnataka and Tamil Nadu have sought for over a century to fashion an effective and suitable pact for storing and sharing water, and the Indian Supreme Court has periodically served as arbiter, the deals are torn asunder in periods of drought, which are becoming more numerous. In September, violence broke out in Chennai, Tamil Nadu’s largest city, as protestors attacked vehicles bearing Karnataka license plates. In Bengaluru, Karnataka’s Silicon Valley, protestors burned 40 buses, pelted police and downtown buildings with stones, and brought road and air transportation to a halt. Two people were killed and Prime Minister Narendra Modi personally appealed for calm. In March, Tamil farmers demonstrated for three weeks in New Delhi to urge government agencies to forgive their loans with national banks. In order to draw more attention to the protest, some farmers displayed the skulls of those they say committed suicide from crop failures caused by the drought. 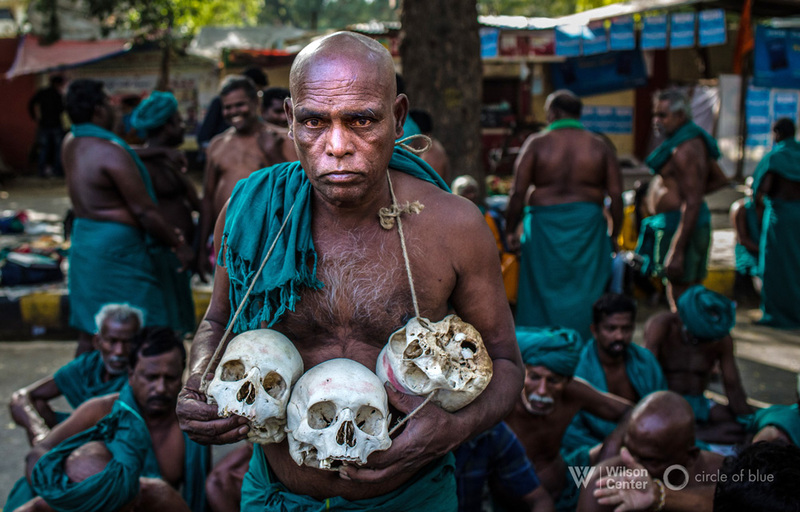 “These skulls are all that remains of our brothers who killed themselves because they could not repay their debts,” said P. Ayyakannu, president of South Indian Rivers Linking Farmers Association, during one of the protests as he sat by a row of eight skulls. That question has largely producing arm waving in government offices in two states. In interviews in Tamil Nadu, two state environment and economic officers declined to talk about the Cauvery River at all. In fact, establishing new rules of the game to ensure sufficient supplies of water during dry periods would require profound adjustments to land management, agricultural practices, industrialization, and conservation. The Cauvery River rises in southwestern Karnataka and flows southeast to its mouth at the Bay of Bengal. Every economic and cultural sector along its 800-kilometer (500-mile) corridor would be affected. The water-absorbing forests in the Western Ghats, the mountain range that serves as the source of Cauvery Basin waters, are being cut for coffee plantations and forest products. Contemporary cultivation practices for modern varieties of rice, coconuts, sugar cane, turmeric, and other crops require huge supplies of water. Both Karnataka and Tamil Nadu have encouraged rampant development of water-consuming industries. And the population of the Cauvery Basin has grown over 30 percent in the last generation. The recent decades of conflict are a departure from the past. The rich soil of the Cauvery Delta’s 1 million hectares (2.5 million acres) of cropland have been farmed for thousands of years, according to historians and farmers. Farm families boast they cultivate the same ground that their ancestors did 20 generations ago. Here in the 460,000-acre Thiruvarur District, though, farmers are far from certain that agriculture will persist much longer. Wealthier farmers, who typically cultivate 10 or more acres of rice and other crops, rely on wells to tap groundwater for irrigation. But the drought and over-pumping are lowering the water table, and in some areas, allowing salty seawater to seep into aquifers. Everywhere he looks now, though, Varadharajan sees trouble. Climate change has altered the seasonal monsoons so markedly that rain no longer falls in week-long soaks. Instead the rain, if it comes, is heavy and violent. “Our ground water is not being recharged,” he said. The wells themselves are going dry, so they need to be drilled deeper, adding installation expenses and requiring bigger and costlier pumps. According to state hydrology maps, almost all of the delta’s groundwater reserves are overexploited or unusable because of saltwater intrusion. That, indeed, is the situation in Venganthankusi, about 20 kilometers from Mannagurdi, and just three kilometers from the Cauvery River. The ancient irrigation canals that typically supply water to the village’s paddies have been dry all year. Survey Prompts Change – But Is It Enough? Still, villagers said no one anticipated Vijayakumar’s death. His friends and family said it was the first suicide in the village’s history. In December, Tamil Nadu state officials declared that there was no direct link between the dry conditions and the spike in suicides and heart attacks. They blamed the deaths on a range of emotional imbalances connected to family, age, health, and lingering financial stresses. Pon Chandran, a retired banker from Coimbatore and a member of the People’s Union for Civil Liberties (PUCL), a 42-year-old human rights group, also took exception to the state’s effort to shift blame for the Cauvery Delta deaths. In January, Chandran, his wife Thanalakshmi, a retired teacher, and 21 other PUCL activists joined Bharathiselvan in undertaking a three-day field survey of heart attacks and suicides. The researchers divided into three teams that fanned out across three delta districts to interview 25 surviving families. The results, they say, clearly show that the spike in mortality occurred among farmers who relied only on monsoon rains and surface water for irrigation. Unrelenting water scarcity ruined harvests and broke the strong hearts and steadfast wills of delta farmers. In the weeks since the PUCL survey findings became public, Tamil Nadu changed its position. State authorities in January asked India’s Central Government for almost 400 billion rupees ($5.9 billion) for drought relief. Farmers have been invited to work for 150 days as government-paid laborers at 60 rupees per day (almost $1), 50 days more than the standard government work program for farmers. Families of suicide victims have been promised cash awards of 300,000 rupees, about $4,700. Rice farmers that lost one-third or more of their crop could receive 5,465 rupees ($85) per acre in compensation, and land taxes could be suspended. Sources: CNN, Government of Tamil Nadu, Kenyatta University TV, The National, People’s Union for Civil Liberties, The Wire. Photo Credits: Used with permission courtesy of Amirtharaj Stephen, Dhruv Malhotra, and Circle of Blue. Graphic: Jillian Du/Wilson Center. Map: Cody Pope/Circle of Blue.